A new diffuse ring, coincident with the orbits of Saturn's moon's Janus and Epimetheus, has been revealed in ultra-high phase angle views from Cassini. Ultra-high phase angle indicates the sun is behind the target. 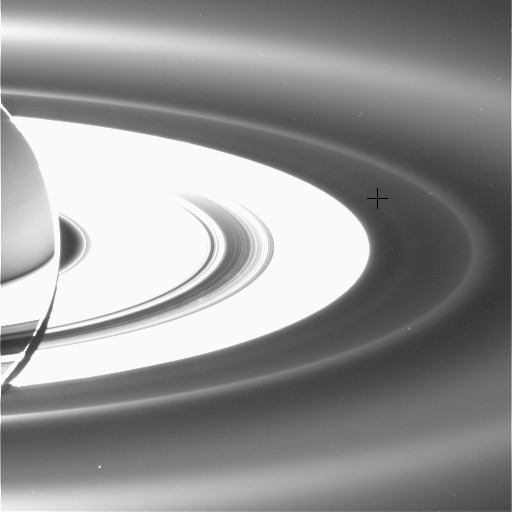 The new ring is visible in this image (marked by a cross in figure 1) outside the overexposed main rings and interior to the G and E rings. The G ring has a sharp inner boundary; the E ring is extremely broad and arcs across the upper and lower portions of the scene. While it is not unexpected that impact events on Janus and Epimetheus might kick particles off the moons' surfaces and inject them into Saturn orbit, it is, surprising that a well-defined structure exists at this location. The view looks down from about 15 degrees above the un-illuminated side of the rings. Some faint spokes can also be spotted in the main rings, made visible by sunlight diffusing through the B ring. The image was taken in visible light with the Cassini spacecraft wide-angle camera on Sept. 15, 2006, at a distance of approximately 2.2 million kilometers (1.3 million miles) from Saturn and at a sun-Saturn-spacecraft angle of almost 179 degrees. Image scale is approximately 250 kilometers (155 miles) per pixel.